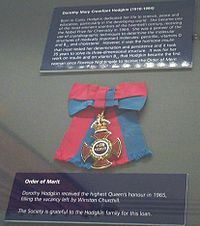 displayed in the Royal Society, London, 2004. Dorothy Mary Hodgkin OM FRS (12 May 1910 – 29 July 1994), née Crowfoot, was a British chemist, credited with the development of protein crystallography. Hodgkin received the Nobel Prize in Chemistry in 1964. Hodgkin was born in Cairo Egypt. She and her sisters were sent to live in England when World War l started. She spent the rest of her life there. Her mother was an expert on nature and Ancient Egyptian Textiles. Hodgkin’s father was a British archeologist and scholar. She studied crystals and became a teacher Somerville College at University of Oxford. In 1969, Hodgkin was able to use computer technology discover the structure of Insulin. Insulin is a protein in the body that is used to treat diabetes. She advanced the technique of X-ray crystallography, a method used to determine the three dimensional structures of biomolecules. Ernst Chain thought he found the structure of penicillin. Hodgkin proved he was right. She also found the structure of vitamin B12. For her work she was awarded the Nobel Prize in Chemistry. In 1969, after 35 years of work and five years after winning the Nobel Prize, Hodgkin was able to find the structure of insulin. X-ray crystallography became a widely used tool and helped to find structures of many biological molecules such as DNA. The structure of molecules helps us understand how they work. Apart from the Nobel Prize, she was appointed to the Order of Merit, and given the Copley Medal, the top award of the Royal Society. She was Chancellor of Bristol University from 1970 to 1988, and President of Pugwash from 1976 to 1988. Pugwash is an organization which holds conferences on Science and World Affairs. Her best-known student was Margaret Thatcher, who consulted her when she (Thatcher) was in office. Hodgkin was not allowed to enter the United States without special permission from the CIA. She protested and wanted world peace. She also had a good relationship with J.D. Bernal, who was considered too liberal. She received the Lenin Peace Prize in 1987. Hodgkin died of a stroke in 1994. ↑ "Dorothy Crowfoot Hodgkin." Encyclopedia of World Biography, Gale, 1998. Student Resources in Context. Accessed 31 Mar. 2017. ↑ Howard, Judith A.K. (2003). "Dorothy Hodgkin and her contributions to biochemistry". Nature Reviews Molecular Cell Biology 4 (11): 891–896. doi:10.1038/nrm1243. PMID 14625538. ↑ Guy Dodson (2002). "Dorothy Mary Crowfoot Hodgkin, O.M. 12 May 1910--29 July 1994". Biographical Memoirs of Fellows of the Royal Society 48: 179–219. doi:10.1098/rsbm.2002.0011. http://rsbm.royalsocietypublishing.org/content/48/179.full.pdf+html?sid=bbcbbb73-078e-4656-8918-1c018a94aab4. ↑ Ferry, Georgina. 1998. Dorothy Hodgkin: a life. Granta Books, London. This page was last changed on 17 November 2017, at 11:47.